This last page is mostly straight from ebay and Google Images with little information and few active links or even attributions. 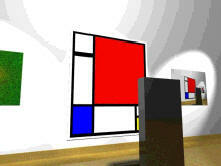 This picture started out as a kind of joke, when I combined a Mondrian-object I had recreated with the monolith from 2001. A viewer looking at a portrait? 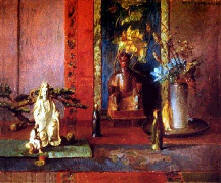 For other forms of beings Mondrians paintings might be still life paintings filled with everyday meaning. Gradually the gallery grew up. It is not clear if the monolith is a spectator or perhaps an art object - didn't the earthlings place the moon monolith on the UN plaza? 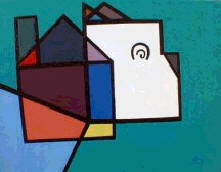 You're bidding on a charming 14" x 18" acrylic on canvas titled "Dog House Running" by Los Angeles artist A. Delgado. He's a dog! He's a house! He's both! Whimsical and soothing, with beautifully chosen colors and a subtle nod to Mondrian. Great addition to - or beginning of - your art collection! All I have is a title, and I'm not sure whether even that is a typo. At last a live link. There are several variations on the theme on that site. 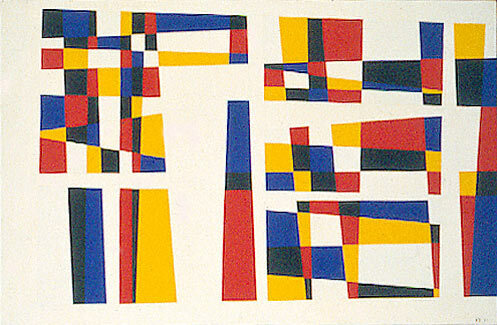 "Mondrian", o/c, 24 x 36, 1957. Created by intuitive artist, Barry Davies using mixed media including cardboard boxes, Papier Maché, glue, wood, acrylic paints and high-gloss polyurethane varnish. I had absolutely no inforation on this, and my link has died. This new all-metal wall hanging named 'PM Reprise' is hand-made by the artisans at Factory 15 in Lexington, KY. The piece is constructed of steel rod and sheet aluminum. The framework is flat black and the metal inserts are enamel primary colors including, bright green, yellow, orange, red and blue. PM Reprise is signed and numbered on the back by the Factory 15 artist. 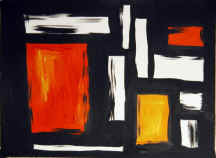 It is reminiscent of and pays homage to the work of Mondrian. This looks great hanging in an Eames, contemporary, or space age style home. PM Reprise will make any room brighter and serves as a great focal point. The width of the wall hanging is approximately 42" and is about 22" tall. It stands out from the wall almost 1½" which makes for great shadowing when lit correctly. There are two hanging points on the back. Factory 15 is a designer and maker of contemporary furniture, lighting and decorative pieces with a focus on items for living rooms and home theaters. All Factory 15 products are made by hand locally in Lexington, KY the heart of the Bluegrass. 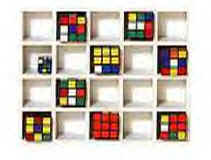 Silly me - how could I have ignored the Rubik Cube? This is obviously a Very Clever Chap. Though maybe just not quite as clever as he thinks. The eBay sale included both illustrations, so I'm not sure which you get. 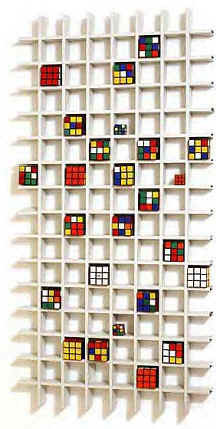 Time to start collecting Rubiks and making your own. There are tens of column-inches of eBay description which I will edit. The photo shows CUBISM - A sculpture by British artist Stephen Rumney made from found objects (Industrial ventilation grill with Rubics cubes). This piece was displayed in January and February 2000 as part of a groundbreaking Modern Art show at the 1 Off Gallery in London entitled VISION 2000. The show attracted a lot of media attention and critical acclaim by the press and all those who came to see it. ARENA MAGAZINE:"We've seen the future of art"
TIMEOUT MAGAZINE: "A timely exhibition kicking off the new millennium with a thought provoking image of the last one"
SKY MAGAZINE: "A celebration of the colour and richness that surrounds us"
THE OBSERVER MAGAZINE: "A monument to the last millennium"
SEARCH TERMS: Cubist, Artist, Pop Art, Modern Art. Contemporary Art, Kitsch Art. British Art. Installation Art, Jeff Koons, Damien Hurst, Damian Hirst, Tracey Emmin, Tracey Emin, Poodles, Cubism, Mondrian, Mondrien, Flying Ducks, Modern British Art. I'd say it's nice, and super serendipity, but careful with that green. Two works found on Google. Found on Google, link here. 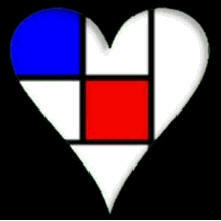 Piet Mondrian has been my mentor and guide through out my abstract painting career. Even though I had difficulty mixing colors, I have always been drawn to bright primary colors! Also I have difficulty satisfying myself when trying to draw objects, such as oranges, vases, flowers, or landscapes; however, with my engineering training, I can draw straight line objects like floor plans, wiring diagrams, etc. So naturally, I applied those technique to painting hard-edge primary colored objects. 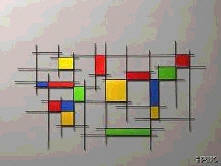 I guess this is one of the Mondrian type paintings that I have done that has pleased me most. One of my co-workers, whom I consider a real artist, entered this painting in the Paris Art Fair. (Paris, Texas; not Paris, France) It received an "Honorable Mention" ribbon. You would have thought that I had won First Place and Best of Show! I would have liked to buy this one, but too expensive. My original link is dead, but here's another. 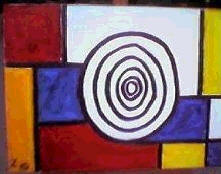 "Tout Le Mondrian" - a Mondrian inspired original acrylic on canvas painting by me - Michelle Y Williams. Measures 21" x 45" and wired as a horizontal piece. Primary Colors outlined in Black - the Blues are a bit darker than they appear (Ultramarine & Cobalt). My work has been actively collected for over 5 years and is sold via galleries and directly to private individuals and corporations, and includes many commissions. All of my pieces are original and my style is diverse. I utilize all professional artist grade paints and supplies. Gallery Wrapped Canvas-Superior Professional Quality-Hand Crafted Stretcher Frame & Hand Wrapped Canvas-Stapled on the back-NOT On The sides of the painting as with most mass produced canvas. 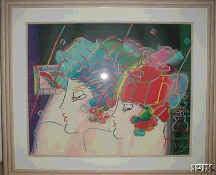 This painting boasts a 2 1/4" deep stretcher frame with finished/painted sides - ready to hang, no frame required. The back is wired and we even provide the picture hook(s) necessary for a professional hanging. On sale on eBay - I'll be bidding. 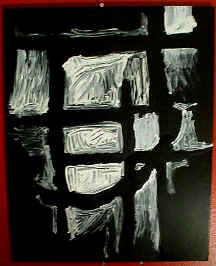 An original (not a print) watercolor entitled "In Mondrian Mode." 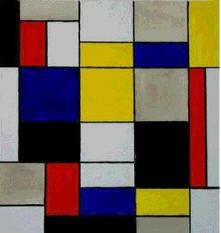 After Piet Mondrian. Size is 7 1/2" x 11 1/4", including a 1/2" border. Signed by the artist. Painted on heavy 300 lb. watercolor paper. I lost the auction for the first and the second, but the second came around again later and I won it with a lower bid. 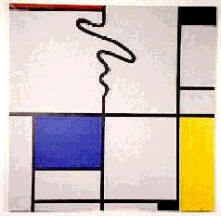 This is my favourite of four Mondrian Homages on sale from Fred. I'll bid. 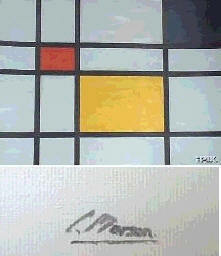 Since then, Fred seems to have cornered the market in Mondrian Variants - there are always a few available on eBay. Well, that was the case in 2001, but no longer. Found this in the Google Images. My original link has died, but here's another. Born in 1906, Smith was raised on farms and ranches among a large population of Choctaw and Chickasha Native Americans in the territory later annexed by the U.S. as the state of Oklahoma. He came to New York City in 1936 to study at Columbia University's Teachers' College, and that same year saw masterpieces of European Modernism by Jean Arp, Constantin Brancusi, and Piet Mondrian, among others, from the A.E. 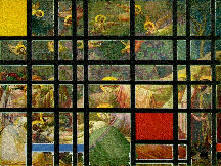 Gallatin Collection then on view at the Gallery of Living Art, New York University. The young artist began his career depicting subjects inspired by life in Oklahoma and New York in an amalgam of Surrealist and Expressionist styles. The power of Brancusi and Mondrian's art was ultimately irresistable to Smith and in 1945 he began to explore the formal problems inherent in the creation of non-objective art. 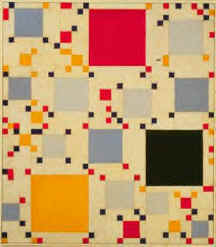 His tribute to Mondrian and New York, Homage to "Victory Boogie Woogie" I (1946), is a white canvas filled with large and small squares. 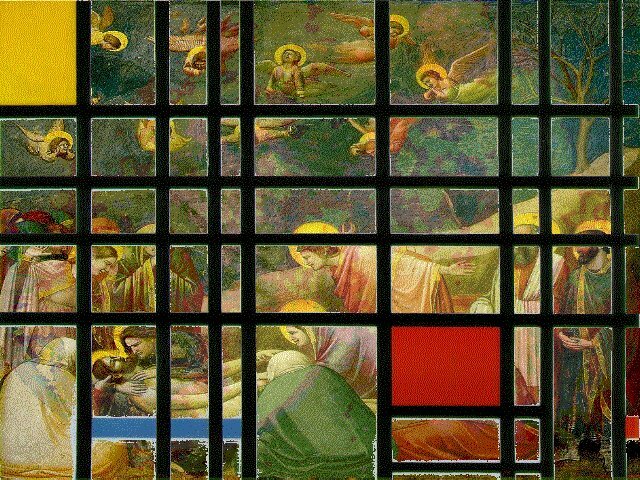 Smith shared Mondrian's affection for New York, writing in 1989, "New York City revealed its physical self to me through the mountains and canyons of the Southwest. There were the ups and downs--the high peaks, the in-betweens, or the canyons, and topped with the great dome. ...I felt the city to be a perfect equation for a great abstraction." (b St Petersburg, 1 July 1907; d New York, 22 Nov 1981). American painter and sculptor of Russian birth. Having moved first to Constantinople (now Istanbul) and then in 1923 to New York, he studied at the National Academy of Design (1924-30). Inspired both by Surrealist biomorphic forms and geometric abstraction, he painted his first non-objective work in 1933 and was a founder-member of American Abstract Artists in 1936. During the Depression of the 1930s he painted numerous abstract murals under the auspices of government-sponsored art programmes. By the late 1940s, when he taught for two years at Black Mountain College, he was concentrating on a colouristically diverse variant of Piet Mondrian's Neo-plasticism, the style that characterized both the painted columns Bolotowsky began to make in the 1960s (e.g. Metal Column 1966, 1966; Minneapolis, MN, Walker A. Cent.) 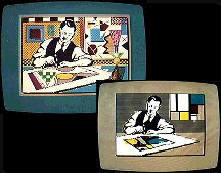 and the paintings of the rest of his career. Artist:Ilya Bolotowsky Title: Untitled Year: 1979 Medium: Silkscreen [Signed and Numbered in Pencil] Edition: 225 Paper Size:29.5" x 22"
Hi there! Let me tell you a little bit about my background. I've been painting since I was old enough to lift a crayon. I was involved in art throughout high school, painting various mustangs (our mascot) on just about everything I could get my hands on! I went on to college and graduated in 1996 with a BA in Graphic Design and a concentration in color theory, but my main interest has been web design. De verkoper neemt de volledige verantwoordelijkheid voor het aanbieden van dit object. Als je vragen hebt, neem dan contact op met de verkoper voordat je een bod uitbrengt. Veilingvaluta: Euro ( EUR ) (tenzij anders aangegeven). 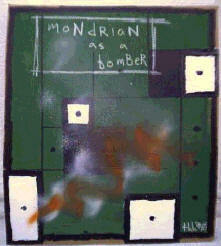 "MONDRIAN AS A BOMBER" - a brand spankin' new piece by me that gives a funky Outsider / Graffiti treatment to the modern artwork of Piet Mondrian. I wanted to try a new smaller piece that would incorporate the styles of another artist, but still have my style, so this piece was born. 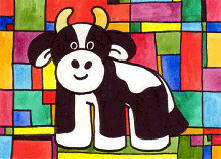 Sure, I know Mondrian worked in primary colors, but this ain't HIS piece! Very vibrant and bold in color, this smaller piece would look great in the collection of any fan of Modern, Graffiti, or Outsider art! This piece was alot of fun to work on, as it always feels good to step outside of myself and work on a piece that isn't something I'd normally do, so I hope you enjoy the difference! The swipes of spray paint give the piece a very Urban feel to it and give it that essence of street credibility...not too overdone, but just enough. Enjoy! thh70 is the pseudonym I go by in all my artistic endeavors. You will never see my real name attached to my artwork. Besides painting, I am also an accomplished recording artist. My paintings are in private & corporate collections across the United States, Canada, Asia, and Europe, as well as have been shown in various art shows and photographs, with more to come. Since November 1st, 2000, I have sold over 250 paintings & drawings on just my Internet auctions, so thanks for your continued support! Brian joined the department in 1985. He is a representational painter whose current series of psycho-mythological narratives explores those transitional, tentative moments that occur between times of purposeful activity. In an age that is often categorized as being in a perpetual state of crisis he seeks, by monumentalizing the ordinary, to reinforce the shared human core that is embedded in everyday experience. 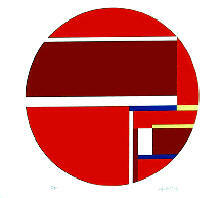 "Untitled Mondrian" by Elizabeth Sadoff -- Adapted from Mondrian's 1928 piece "Composition with Red, Yellow and Blue," this piece features three -- or is it four? -- of our favorite characters. This original, one-of-a-kind Disney Artist Board was previously displayed at the Disneyland Pacific Hotel. 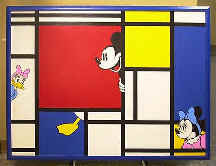 SIZE: 38.5" x 50"
"Untitled Mondrian" by Elizabeth Sadoff -- Adapted from Mondrian's 1928 work "Composition with Red, Yellow and Blue," this piece features one of our favorite characters. This original, one-of-a-kind Disney Artist Board was previously displayed at the Disneyland Pacific Hotel.SIZE: 46" x 76"
This is a very authentic painting by Peter Max. It is in a beautiful brown frame and in mint condition. Not much impressed - starting at $900. I wouldn't give you $90. On eBay. Now available to wear, see here. 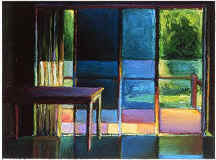 To view more of Edward Larson's work and an artists statement visit here.